Getting back into the swing of things: juggling a baby, a job, life, and making food for my growing family. Whew. It. Is. Exhausting. And I love it. I know a lot of people say that they can’t imagine life without their kids. I now know what they mean. Some folks say it changes your life. Yep. And some folks say it’s not that different. Yes to that too. I can and can’t remember life before our little sweet pea arrived. It feels so different and the same at times. Before we had baby girl, we had long talks about this. We wanted to have a baby and still be us. We wanted to not get caught up in the daily grind and instead adapt our family of three to our existing rhythm. I think we’ve been very successful, thanks in part to having such a sweet baby. But one thing that I was determined to not change were our eating and cooking habits. You see we make most things from scratch: bread, tortillas, yogurt, granola, to name a few. Occasionally, when I know I have a busy week, I will stop and grab a loaf of bread, but not without giving myself a stern a talkin’ to. I think the main change is the ability to let go and not make myself feel so guilty for grabbing that packaged product. And that I’m able to do in my sleep deprived, desperately wanting to return to my baby girl-state. Easily. But it’s also just as nice to know I can still juggle the demands of baby, my sleep, and of bread baking too. 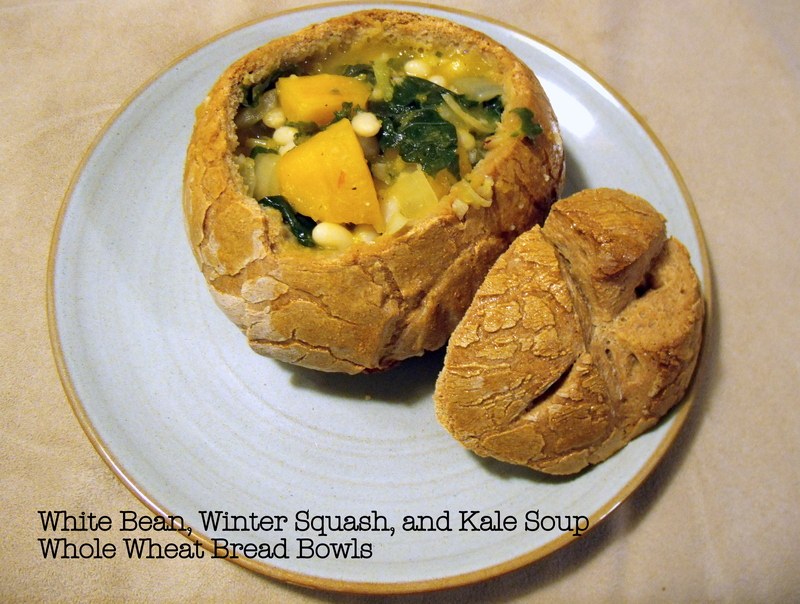 So here’s a recent accomplishment…freshly baked little whole wheat bread bowls and a supremely nourishing vegetarian winter soup for you. Enjoy! Toppings/garnishes – A hard salty cheese (parmesan/asiago), bacon, hot sauce, etc. Sort through beans and pick out any weird looking ones and rocks, if you’re lucky! Rinse. Place the beans in a large pot. Cover with 2 inches of water. If you have some whey, throw a healthy dose in there. Let sit for 12-24 hours. Drain and rinse. Return beans to pot, cover with water, add a handful of salt, 2 cloves of garlic and place on high heat. When it starts to boil, reduce to simmer and cook until al dente. This could take anywhere from 30 minutes – 1 hour, depending on the type of bean ad how long the soak took. Don’t overcook or they will turn to mush! Preheat oven to 400 degrees. Peel and de-seed the squash. Cut into bite-sized chunks. Place on a baking sheet, drizzle generously with olive oil, S & P, and chili powder. Roast for 25 minutes, until edges are just beginning to brown and caramelize. In a large dutch oven, heat your fat of choice (EVOO, coconut oil, butter, bacon fat). Saute onion until translucent and cooked through. Add garlic, pepper, sage, and season with S & P.
Add beans, squash, and water/stock until the contents are covered. Bring to a simmer. Add kale. Simmer for about 10 minutes, until kale is just cooked through and tender. Season if needed. I also put my immersion blender in there for a bit to create a thicker, creamier soup that still had hearty chunks. You could scoop out about 1/4 of the soup and puree in a blender to get this effect. Top with something salty, we used aged asiago cheese. Bacon would do too. In your electric mixer bowl, place water, yeast, honey, and EVOO. Stir slightly with a spoon and let sit for 5-10 minutes. Mixture should get foamy and puffy and smell like yeast. With your dough hook on a low speed (I used 2 and stir the whole time), begin to add flour in 1/2 cup increments. You can stop adding flour when the dough pulls off the sides of the bowl and dough isn’t extremely sticky. Knead dough for 10-12 minutes. You know the dough is done with you can press it firmly with your finger tip and the dough bounces back. If the dough is still really sticky, place on a floured work surface and knead a few times. Oil a large bowl with EVOO, place dough in bowl and coat with the oil. Cover loosely and set in a warm place to rise for at least an hour and a half. Punch down dough after it’s risen. Form into a large round. Cut the round into 4 equal pieces and form these into balls. Place the 4 pieces onto a baking sheet. Cover and let rise again for another 30 minutes. Gently form each dough into a tighter ball. Score the top of each bowl and brush with beaten egg. Bake for 40-45 minutes or until golden and hard. Let them cool completely, then using a serrated knife, cut a round out of the middle and fill with soup! This entry was posted in Uncategorized and tagged bread, fall/winter, soup, vegetarian by callywoodfarms. Bookmark the permalink.